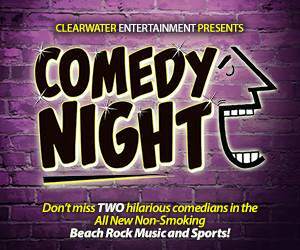 Laugh it up in the Beach Rock Music & Sports Lounge! Guitar-slinging comedian Eric Haines brings pure entertainment to the world of comedy, with an act that is part rock concert, part comedy show and part twisted, bizarre circus. Eric Haines grew up in Montana, where he was considered aristocracy because he owned an air compressor. Thinking that the easy money from performing meant he could avoid a real job, he quickly developed his own comedy-based variety show for corporate events. When Haines began working full time as a professional comedian in 1995, he had already been working as a corporate entertainer for over ten years, a remarkable testament to how hard someone will work to avoid work. 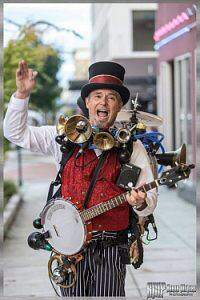 He has over twenty-five years total experience working as an all-around entertainer, both as a comedian and in the professional fields of theater, children’s theater, school assembly programs, fairs and festival entertainment, school workshops and corporate entertainment. A Night of drinks and laughing to start your week right!